Welcome to the Winter session! Here is some information to help you and your child get the most out of your Music Together experience. Your Participation is the Key – Young children learn by imitating their grown-ups. You are the role model for your child as he or she forms an attitude towards music making. 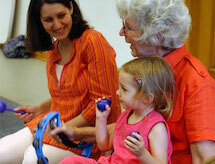 So, in class it is important for you to participate – sing, dance, drum, wiggle -- have FUN! If your child sees you having fun making music, they’ll want to try too! Do you sing off-key, or can’t remember the words, or have two left feet? No worries. – sing anyway! We’ll never criticize you, and your child thinks you’re a superstar! Your Child’s Job is Done When He or She Enters the Room We want the adults in class to participate actively -- but all your child needs to do is show up. Each child has his or her own learning style, personality, and temperament. Your child does ­not need to sit still, pay attention, or do what the teacher is doing. Young children are “sponges” and absorb the rich musical experience of the class whether they are staring at the ceiling, checking out their socks, practicing walking skills, or interacting with other kids. They are learning music skills even when they are “just” observing others, sitting still in your lap, or off exploring on the other side of the room. So, unless they are posing a safety issue to themselves or other children, let them do their own thing, and know that they are learning in their own way. You’ll be amazed at what they show you in a few weeks’ time, at home. Music Together Happens at Home All Week Long! Class is fun and a place for inspiration, observation and absorption – your child’s musical expression will happen later, at home. The kids “download” the experience in class. They “print it out” at home. Each session, you will receive the songs we will sing in class – on the “Hello Everybody”app with your unique download code, a CD, and a picture songbook. Listen to the songs at home and on the go as frequently as possible – this will make a HUGE difference in what your family gets out of our program. Play the music for your child while he or she is playing, or before taking a nap, or at bedtime. Play the songs in the car or while you are cooking dinner, and sing them when changing a diaper or pushing the stroller! Repetition is key for young children! Use the illustrated songbook with your child, as you would a picture-book and use it to help you remember the songs, and get activity ideas. Sheet music is available as a free download. SING! Please do not talk during class. You are your child’s primary role model; if you lose focus, the children will as well. When everyone is singing, the children get drawn into that musical energy. When adults talk during class, the children get confused where to put their attention, and the class feels disorganized. In addition, the silence between songs is a crucial time for the children to develop the important ability to audiate -- to be “thinking musically” even when no music is present. During that silence, we might hear your child sing! Please Arrive on Time: We do our best to have our classes begin and end on time. Please make every effort to be prompt. It’s so much nicer for your child to be part of the Hello Song. Phones / Photography / Food / Drinks / Toys / Bare Feet: Your Music Together class is a unique opportunity to let your child see you making music and engaging in the activities with them. Please turn your phone off and put it away before class. Photographs or videos are not allowed. Please do not bring food, drink, or toys into the circle. (Nursing is always okay.) Please wear socks in class. Guest Policy: The guest fee for all non-enrolled children is $20 per session. There is never any charge for visiting adults, so bring the grandparents! Family Music Zone: Every session there are new fun videos, activities, coloring pages, etc. on the “Family Music Zone” online – accessed with your download code. If you have any technical issues with accessing your songs or the Family Music Zone, or questions about the “Hello Everybody” app, please email support@musictogether.com. If you have any suggestions, comments, or requests, please let us know! IN CLASS AND AT HOME, LET’S MAKE MUSIC TOGETHER THIS WINTER!